How has Headache Soothe helped others? How do I use Headache Soothe? When muscles in the neck and shoulders tense up, common discomfort and pain can result in the head. This discomfort can radiate from the neck, back or eyes and is sometimes described as constant pressure, as if the head ‘were being squeezed in a vise’. Migraines are a certain type of headache, and anyone who has ever experienced a migraine knows just how painful and debilitating they can be. The typical migraine causes a severe headache which can last between 4 and 72 hours in left untreated and it often comes with a number of other symptoms such as nausea, vomiting, mental confusion as well as light and sound sensitivity. In some cases, migraines are preceded or accompanied by neurological symptoms known as migraine aura. These sensory symptoms often begin some time before the headache, and may include disturbances in visual perception such as flashing lights, seeing zigzag lines, blurred vision, sensations of dizziness and other visual hallucinations. Migraines with aura, also known as classic migraines, are less common that migraines without aura. Migraines tend to affect people differently and will vary in severity, duration and frequency between individuals. Some people may be plagued with migraines regularly, while others will only experience them once or twice in a year. The good news is that there are a number of treatment options available today that weren’t available just a decade ago, and much can be done to help prevent migraine attacks, and to ease the pain when they do occur. In today’s modern world, work hours can be especially long and tiresome. Afternoons are particular common times for headaches to occur. There are certain things that can be done to support the muscles in the neck and back, and to promote healthy heads! Short breaks from work should be taken throughout the day. These breaks should not include caffeine! Water consumption (8 glasses) should be a priority each day. This will help keep fluid balance in the brain within the normal range. Sleep is also vital – an individual should maintain a healthy sleep routine with at least 8 hours of sleep per night. Good posture should be followed, with the correct chair for computer work and likewise, the correct glasses should be worn to guard against eyestrain. Natural remedies can also help to support tension free muscles and soothed heads. In fact, natural remedies have been used in traditional medicine for thousands of years to support the healthy functioning of the brain and nervous system. 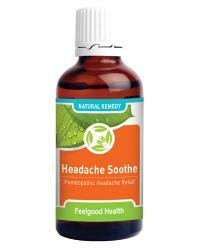 Headache Soothe is a 100% natural homeopathic remedy formulated for the relief of headaches. Headache Soothe can be used to safely support the nervous system and brain through circulation and oxygenation of the blood, without harmful side effects. This remedy contains a selection of homeopathic remedies known for their ability to address common discomfort in the head, neck and shoulders. Due to the concentrated tincture formula, Headache Soothe Drops are absorbed into the system with ease – exactly when you need it! China (12C) – this homeopathic remedy suits those who have sudden and acute head pain that improves from applying firm pressure to the painful area but are worse with light touch, such as combing the hair. Nux vom (12C) - is chiefly linked to workaholic personalities who drive themselves to stress and excess. Used to address head pain that may be brought on by anger and irritability or overindulgence of certain foods, alcohol, and coffee. Chamomilla (12C) – well-known on-the-spot homeopathic remedy used for it’s soothing and calming properties – also used when an individual is irritable and ‘highly string’. Kali phos (D6) - is a homeopathic brain and nerve tonic as well as a nerve nutrient. Used regularly it helps to calm and uplift the spirit and soothe common nervous tension and everyday stress. Mag phos (D6) - acts as a natural anti-spasmodic and a nerve and muscle relaxant and is also frequently recommended for stress headaches. Headache Soothe contains no gluten, artificial flavours, colours or preservatives. It is suitable for vegetarians and safe for all ages. Headache Soothe is presented in a concentrated 50ml tincture formula, making it easy to take. Hold bottle upside down and administer 10 drops directly into the mouth. Alternatively dilute 10 drops in quarter cup water and sip slowly. Children under 12 years use 5 drops. Dosage may be repeated every 20 - 30 minutes if needed until symptoms subside. May be used with MiGone Plus for ongoing support. Headache Soothe supports the body on a cellular level – helping to support the nervous system - from the first dose. Headache Soothe contains homeopathic ingredients in a tincture formula that facilitates rapid absorption into the system – just when you need it! One bottle of Headache Soothe will last approximately 30 days (depending on frequency of use). Soothe common headaches plus anti-stress and anxiety remedy! Safe for all ages: Soothe the common headache plus brain tonic! Soothe common headaches plus Audio CD formulated by a Clinical Psychologist!